Founded in 1994, Heim Plumbing is a family owned business. 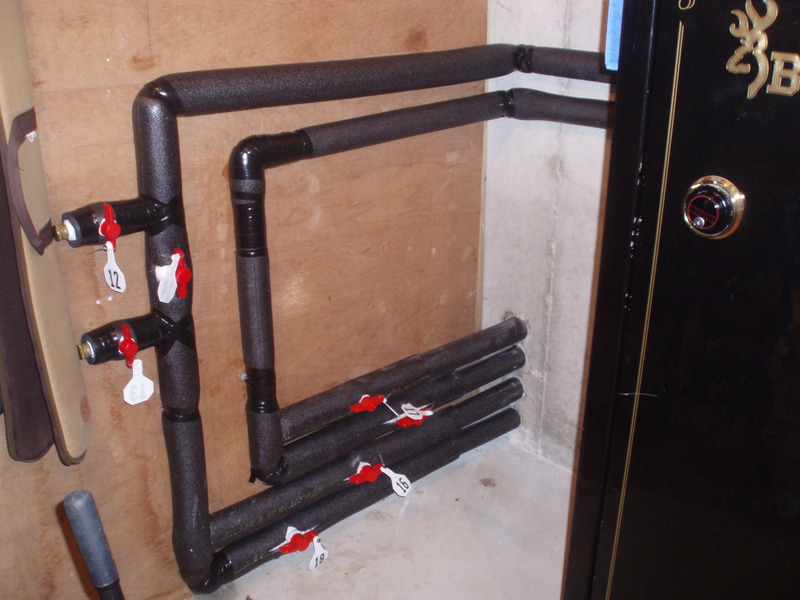 We employ Wisconsin licensed plumbers, and we provide quality products and services to fit your budget. From fixing that little leak under the bathroom sink to installing a money saving geothermal heating system (and everything in between) we have you covered. Our company services a wide area in eastern Wisconsin, including Green Bay, Fond du Lac, Mequon and more. We are centrally located five miles outside of Sheboygan in Howards Grove, WI. Give us a call to serve all your plumbing needs, we'll be there in a flush! Please call us today at 920-565-3958! We offer high quality services with vast knowledge from years of experience to serve you better. With Heim Plumbing you can have piece of mind calling a professional for your plumbing needs. We strive to have the areas best quality plumbing, geo-thermal, and septic services. We constantly work on improving our service to better suit your needs and save you money with high quality, long lasting installations and products. 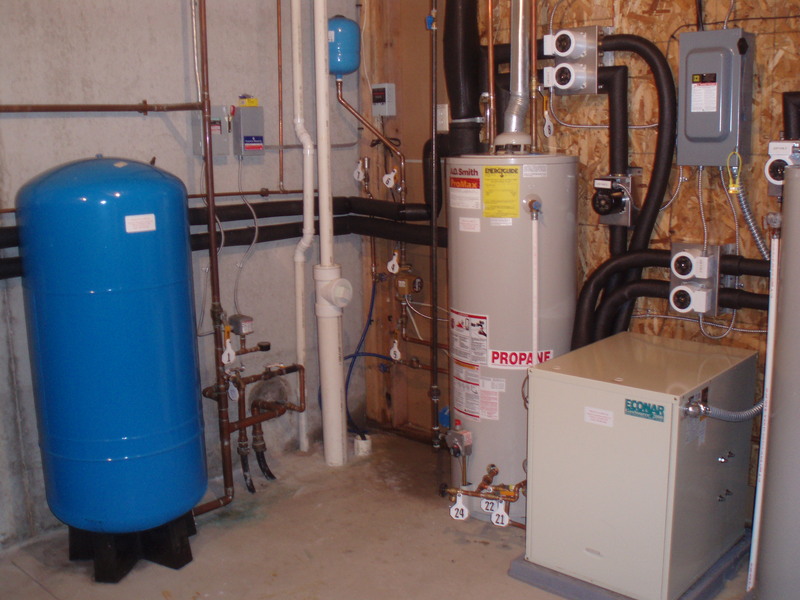 Heim Plumbing offers many top notch services such as repair service, water heater installations and repair, design and installation of septic and mound systems, geo-thermal heating and cooling, water conditioning services. Please click here for services information from Heim Plumbing. We now offer installation and repair of sump pumps. Old Drain Pipes: We replace outdated and/ or leaking cast iron and galvanized steel drain pipes with PVC (ploy vinyl chloride) piping. Water Lines: Most older houses contain galvanized steel and copper water pipes. We can fix, alter, and/or add water fixtures. Or we can simply replace outdated water pipes. Our company utilizes PEX, which is a cost-efficient flexible plastic water pipe system becoming popular due to the rising cost of materials. In addition, we can install CPVC; a cost efficient ridged plastic water pipe which is glued together. Copper provides a nice finished look and is never a bad choice. 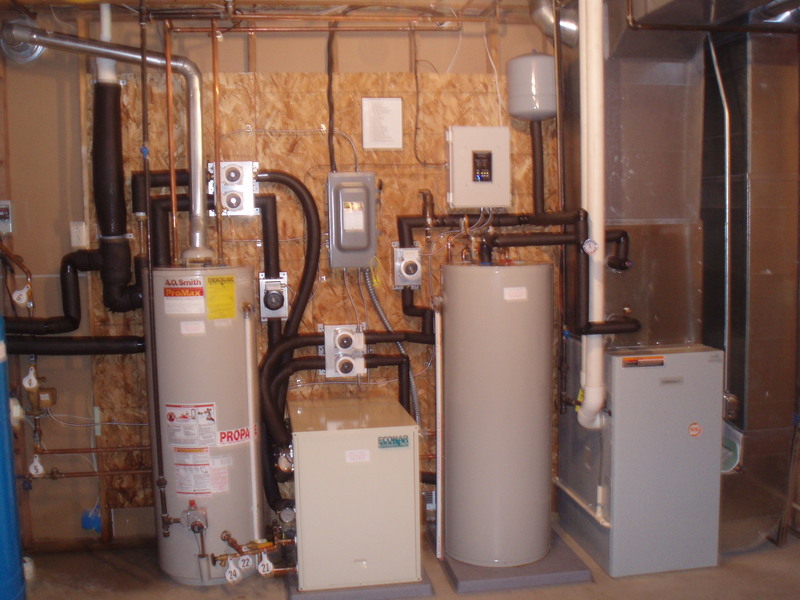 Water Heaters: We work mainly with Rheem, Bradford White and A.O. Smith, but we are happy to service all brands of water heaters by inspecting and replacing parts, cleaning burners, etc. Faucets/ Mixers: Over time, seals and parts inside these valves wear out and plug up due to water impurities and general use. This can cause leaks and other difficulties. We replace seals and inner parts to make your faucets like new. Water Softeners: We work with Hellenbrand products and can fix and replace all parts on Clack or Fleck water softener heads. Sump Pumps: We service and replace all sump pumps; we stock Zoeller and Pro Flow brands. We stock Rheem and Bradford White brands and we have access to A.O. Smith as well. All three brands come with a 6 year tank warranty and as well as a 1 year parts and labor warranty. We also provide replacement parts for these units as well as the knowledge to install and service all makes and models of water heaters. Tankless Water Heaters: Tankless water heaters are increasingly popular because they save space and can use less energy when compared to traditional water heaters. We carry a full line of Navien tankless water heaters, which are manufactured in the U.S.A. We carry Navien because of the quality of their product, their excellent customer service and warranty, and the ease of installing and venting their water heaters. When installing or replacing a POWTS, or Privet Onsite Waste Treatment System, a soil test is needed to determine the best type of POWTS system to use in your application. Out shop's Master Plumber Brad Heim is a certified soil tester. He is experienced and skilled at choosing locations for septic systems. The most common POWTS system installed in Sheboygan County is a Mound System. We provide the full line of Hellenbrand water conditioning equipment, and we can fix any impurity in your water. Personal care items such as shampoo and shaving cream will lather better, so you can use less. Soft water decreases wear on your water heater, dishwasher, washing machine, faucets and fixtures. Produces softer skin and more manageable hair. Washing in soft water helps make clothing whiter/ brighter and increases clothing life. Soft water helps make dishes and glasses shiny and spot-free. Stop rust in toilets, sinks, tubs and showers. We proudly offer high quality products in every installation and repair. Not all brands are listed and we are constantly on the lookout for brands that perform above and beyond expectations for you! In times of today, the cost to simply heat and cool your house is rising. 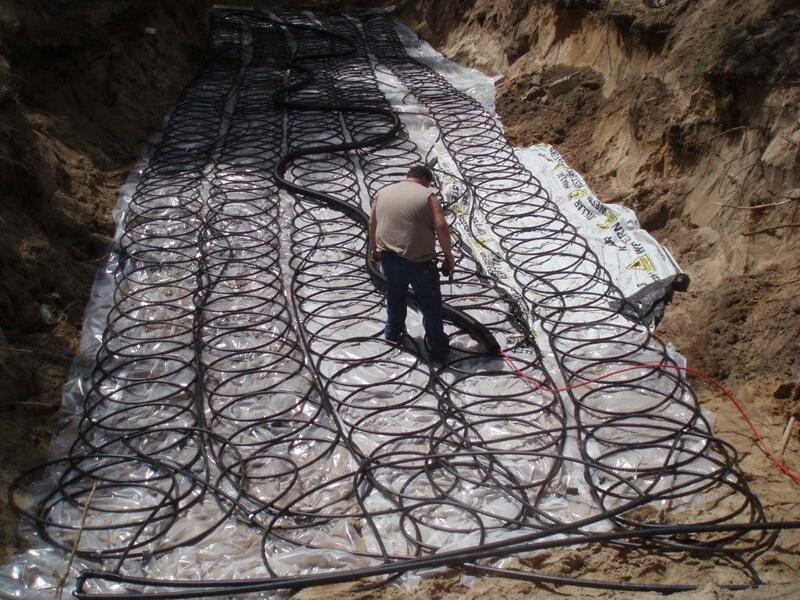 With a geo-thermal system the cost can be lowered by simply using the earth's natural properties. 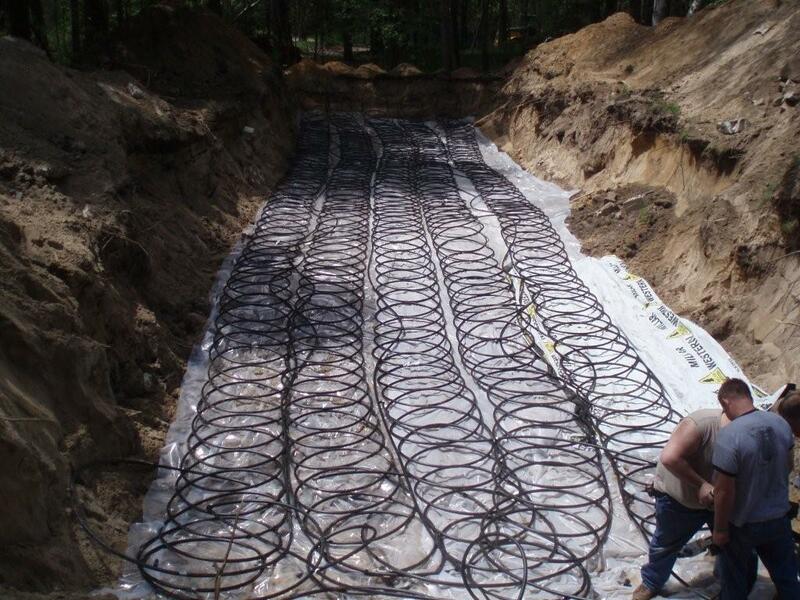 A geo-thermal system is a perfect solution to save money.